The Cat’s sense of smell, not vision, is its primary resource for identifying the individuals and objects in its environment. 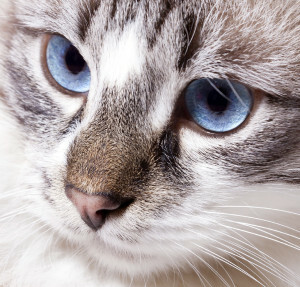 The cat’s visual acuity is 10 times less then that of humans. However, they have 200 million odor-sensitive cells in their noses compared to only 5 million for humans. Cats live in a sensory world completely apart from ours. The sense of smell plays a very insignificant role in human relationships and in our response to our environment, while for cats, it is all-important and may result in some puzzling and disturbing behaviors. The owner puts a scented litter in the litter box-the cat refuses to use it because perfume is actually a repellent for cats. The owner comes home after visiting a friend and petting her friendly, lap-sitting cat-she is greeted with hisses and growls from her cat. A new piece of furniture is moved into the house. The unfamiliar scent is upsetting to the cat and impels it to mark it with its own signature scent. (This can be accomplished by rubbing on it, scratching it, or by spraying urine on it.) Our cats are only doing what comes naturally to them.